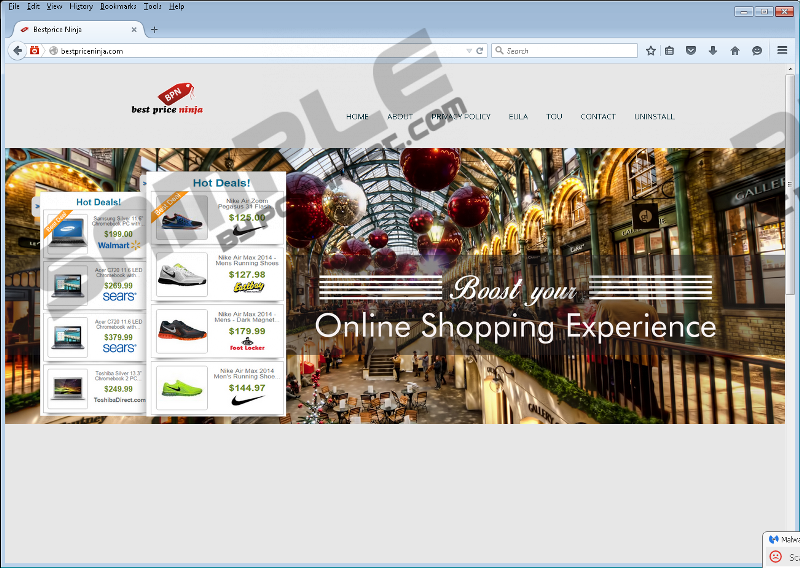 The Best Price Ninja application promises to boost your online shopping experience. Its creators say that you will find the most rewarding deals with the help of the unique and advanced algorithm of this program. However, there is nothing unique about it. Best Price Ninja is a useless adware application, similar to Price-Hero or Proshopper. Therefore, we strongly advise that you remove Best Price Ninja from your computer. To assist you in this process, we have prepared a guide that you will find below. You may ask why we insist on removal of Best Price Ninja. In that case, we should tell you more about dangers that hide behind this program. Let us start by exploring the official website of this application, located at bestpriceninja.com. What we can see is the download button, which does not work. It looks suspicious, and you may ask how Best Price Ninja managed to enter your system. We think that you received this program when it came bundled with other freeware. Most likely, you skipped the possibility of declining Best Price Ninja when you did not attentively read the installation wizard of some program you recently downloaded. You have to scan your computer for the presence of more unwanted applications. User's use of the Site or of the Services, third party advertisements, Third Party Services and the goods or services provided by any third parties is solely User's responsibility and at User's own risk. the brand does not warrant, or assume any responsibility for any content, product or services made available via Third-Party Services. Most likely, you are already convinced that Best Price Ninja should be removed from your system. Here is some good news: You can even do this manually. Just carefully follow our step-by-step instructions. Please pay attention to the fact that you will have to clean your browser from the Best Price Ninja extension additionally. This applies in case you use Mozilla Firefox or Google Chrome. However, the latest editions of Google Chrome block the Best Price Ninja extension. So, we recommend that you always keep your browser updated. Another similar recommendation is to acquire a trustworthy security tool and keep it always updated as well. It would make you completely armored and ready to face every online enemy. Navigate your mouse to the Taskbar and click the Start button. Simultaneously tap the Windows key + I to launch the Settings menu. Find Best Price Ninja and remove it. Click the Open menu icon in the upper right corner. Remove Best Price Ninja from Extensions. Quick & tested solution for Best Price Ninja removal.